While we’re quite familiar with our side of the Milky Way galaxy, the far side of our galaxy is still a bit of a mystery. The reason for this is that the center of the Milky Way is filled with gas, dust and stars, so it is very difficult to see the other side of our galaxy. The central region is so cluttered with material that it sometimes referred to as the Zone of Avoidance, since we have to exclude that region from observations beyond our galaxy. Map of neutral hydrogen in our galaxy. There are some things we can observe about the far side. While the central region blocks most of the visible light from the far side, it doesn’t block as much of the radio waves, infrared and x-ray wavelengths. So we have been able to make some broad observations. We know, for example, that our galaxy really is a barred spiral galaxy because we can map the distribution of hydrogen throughout most of the far side. We can also see some of the spiral arms that exist on the far side. Another way to observe to far side is to focus on the outer region where material flares out from the central plane of the Milky Way. It is sometimes referred to as the flared edge of the galaxy. 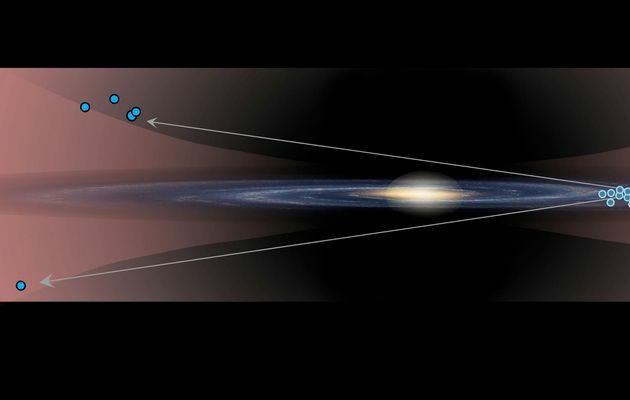 We’ve mapped gas and dust in that region, but now a new paper in Nature has announced the observation of Cepheid variable stars in this region. Cepheid variables are a particular type of star that oscillate in brightness proportional to its absolute magnitude. They are extremely useful because you can use their observed variation to determine their actual distance. So by observing these Cepheid variable stars, the authors could show conclusively that they are, in fact, within the flared region of the far side. This is important because observing their location and motion can help us better determine the overall motion of stars in our galaxy.